Mere weeks before the travesty known as early voting begins on September 28, and fewer than two months before Election Day, Ohio's statewide Republican ticket appears to be cruising to a potential electoral sweep. With one clear exception far down the ticket, this state of affairs has come about not because the GOP's candidates are clearly conservative, but simply because they aren't Democrats. Therein lies the problem for sensible conservatives looking for genuine improvement in Buckeye State government. The Ohio Republican Party, which I prefer to call ORPINO (the Ohio Republican Party In Name Only), should be relieved that the national wave of disgust directed at Democratic political incumbents has washed through Ohio, stirring the electorate to throw the bums out. It certainly deserves none of the credit I'm sure it will claim for the ticket's currently strong position. ORPINO's web site is virtually unchanged since the May 4 primary. A person looking at how its home page appeared on the morning of September 3 would think that the party's most important candidates in November are establishment favorites Jon Husted and Dave Yost, who are running for secretary of state and auditor, respectively. There is a lovely couple at the bottom right of the home page whose last names are Kasich and Taylor. We're told that they're "for Ohio," but not why they are taking up space. John Kasich and Mary Taylor just so happen to be running for governor and lieutenant governor, respectively. Zheesh. 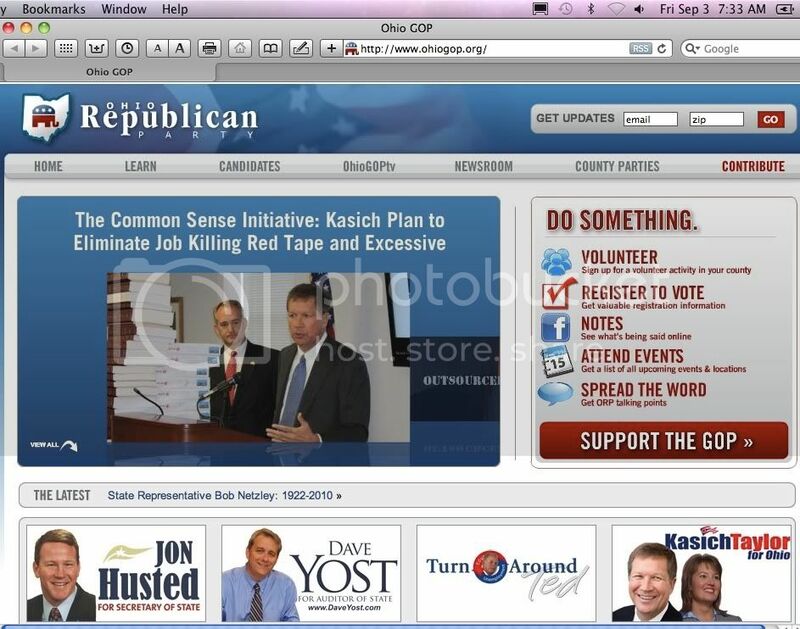 Husted and Yost occupy the same home page real estate they held during the final months of the primary, when ORPINO was doing everything it could to beat back tea party-supported candidates trying to defeat them, and to keep its central committee as free as possible of tea party insurgents. During that campaign, the party establishment outrageously claimed that go-along, get-along statewide candidates and incumbent central committee members largely responsible for why Ohio has been governed economically like a blue state since the mid-1990s -- even while mostly in GOP hands -- had "tea party values." In the process, it spent hundreds of thousands of dollars, possibly even more, protecting its own, both in expensive mailings and Election Day on-the-ground poll operatives. Like so many other state GOP apparatuses, ORPINO is a philosophical Seinfeld: all about nothing. This explains why, as of late July, Democrats in this instinctively conservative midwestern state held an astonishing 7-point party identification advantage. Democrats had smaller ID advantages in Wisconsin (6 points) and Minnesota (4 points). That's embarrassing. ORPINO's response would be: "Well, we're all about winning." Some years that's a necessarily exclusive outlook, like in 2006, when ... oh wait, ORPINO really didn't try very hard to win that year, because the country-club set didn't like gubernatorial candidate Ken Blackwell and his ideas for cutting taxes and controlling spending (you see, the GOP's Columbus I-270 Beltway establishment only cares about winning if it involves getting their turn at the gravy train). Blackwell, who strongly opposed failed GOP Governor Bob Taft's tax increases earlier in the decade, had genuine tea party values years before the tea party movement appeared. John Kasich has been saying the same thing about himself, and it's mostly justified. The Associated Press duly noted last year that the nine-term congressman "was the chairman of the U.S. House of Representatives’ Budget Committee in 1997 that balanced the nation’s budget for the first time in more than 30 years" (I don't know if it's true, but I've heard that the AP journalist who wrote that is on permanent double-secret probation). Anyone properly assigning credit for the prosperity and federal budget surpluses of the late 1990s has to list Kasich's name near the top. Kasich likes to say that when he left Congress in January 2001, the GOP establishment was glad to see him go. 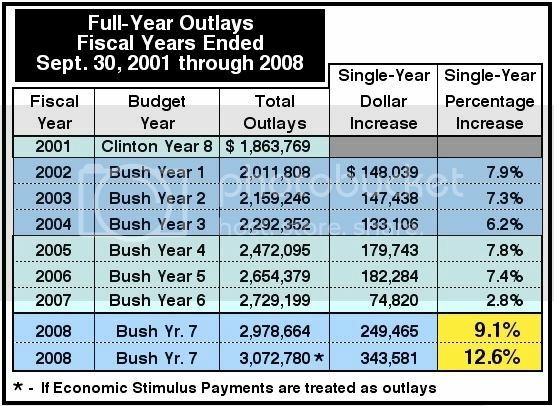 I believe it; just look at how spending soared once he was gone. That said, Kasich has done some strikingly dumb things, leading one to fear that he has developed a false sense of invincibility. Recent revelations that he was on retainer as an occasional guest lecturer at Ohio State during most of last decade and served on a corporate board that voted to outsource several hundred manufacturing jobs out of Ohio in 2006 (the company involved still employs over 1,300 Ohioans) could have been and should have been disclosed and explained away months before someone else discovered them. Fortunately for Kasich, incumbent Governor Ted Strickland has been much dumber, having decided months ago that he could win reelection by relentlessly reminding voters that Kasich used to work for Lehman Brothers instead of defending his record -- an admittedly difficult task, given that Ohio has lost almost 400,000 jobs since he took office. Unlike Kasich, U.S. Senate candidate Rob Portman, the GOP ticket's other marquee statewide name, dumbly believes that being a Washington insider is a feature, not a bug. In June 2009, the Washington Post correctly described Portman as "casting himself as a dealmaking insider" based on this quote: "I know enough now about where the bodies are buried [and] how the Senate works that I know I can be effective there for Ohio." In 2005, when he was leaving Congress to become the Bush administration's trade representative, he told the Cleveland Plain Dealer the following about his reputation for risk aversion: "Some things are worth it for my career and some things aren’t." It shouldn't surprise anyone that Portman's dealings with tea partiers have ranged from tense to nonexistent. In any other year against almost any other Democratic opponent, the two problems just described would be very dangerous, if not fatal. Fortunately for Portman, it's 2010, and his opponent is Lee Fisher. Despite sometimes comedic struggles to find a coherent message, the current lieutenant governor has none. Meanwhile, Fisher's staff turns over so often he should consider relocating his campaign headquarters inside a Pillsbury factory. The upshot of all of this is that Ohio appears to be on track for a change in the party holding political power. Whether it will finally be run like a red state or represented by a genuine conservative in the United States Senate remains to be seen.